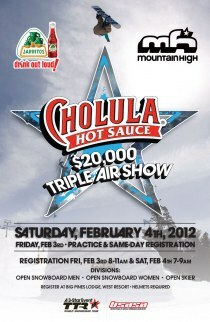 Mountain High is proud to announce the return of the $20,000 Cholula Triple Air Show Saturday, February 4, 2012. For 14 straight years, riders like Shaun White, Zak Hale, and Keegan Valaika have competed for top prize in one of the richest Big Air events on the West Coast. This year first place takes home $5,000 in the Mens Snowboarding Division, $3,500 in Open Skiing, and $2,000 in Womens Snowboarding. The Cholula Triple Air Show is unlike any other big air event of its kind. Instead of one big jump, skiers and snowboarders must tackle three humongous kickers making their landings and execution crucial. Riders are scored on their best of two runs and the top 10 finishers make their way to the finals where awards are paid out to 5th place. The Cholula Triple Air has been upgraded to a 3 star TTR (Ticket To Ride) event this year which means competitors will earn points towards their overall worldwide ranking. The TTR standard is what competitive snowboarders use to rank themselves against each other, and earn entry into events like the Grand Prix and the Olympics. One hundred and fifty of the best skiers and snowboarders in North America will descend on Mountain High Saturday, February 4th, to compete for $20,000 in cash and giant, signature bottles of Cholula Hot Sauce. The professional-caliber jumps range from 40 to 60 feet and competitors are encouraged to take advantage of the FREE practice day on Friday, February 3rd. This is an open event but space is limited so competitors are encouraged to register early Friday, February 3rd. There is no pre-registration at this time. Below is the complete listing of event details including the prize purse breakdown. Don’t miss Mountain High’s richest single-day event, the $20,000 Cholula Triple Air…an event that is as great for spectators as it is for competitors. Practice: (A Full Day of Practice) Friday, February 3rd, 2012 from 8:00 a.m. to 4:00 p.m.
Additional Practice: Saturday 8:30 to 9:00 a.m. Registration Times: Friday 7:30 to 12:00 p.m. and Saturday 7:00 to 9:00 a.m.
Rider's Meeting: Saturday 10 a.m.
Competition: Saturday 10:15 a.m. to 3:00 p.m. Location: Mountain High West Resort in the Big Pines Lodge. Course: Three 40 to 60 foot jumps in a row. Format: Two runs judged on best run. The top 10 from the qualifiers advance to the finals for another best of two runs. Special thanks goes out to Cholula and all our sponsors including Jarritos, the USASA and TTR for making this annual event possible. For more information or to schedule an interview, please contact John McColly at 760 316 7803 or john@mthigh.com. Mountain High is Southern California’s closest winter resort located just an hour and a half from Los Angeles and Orange County. The area consists of three separate mountains (Mountain High East, West, and North), and offers a wide variety of lifts and trails, a world-class terrain park, an outstanding Winter Sports School, and the region’s largest tubing area. Night skiing & snowboarding is available 5 nights-a-week and snowmaking covers more than 80% of the slopes. Mountain High has been the first resort to open in Southern California for the past 14 years and traditionally operates from mid November to mid April. Get more at mthigh.com.